What better way to spend a rainy day (which, by the way, was a very welcome break from the slightly too warm weather of late), than exploring something new. A while back my copy of Papercraft Inspirations arrived, along with a free Christmas embossing folder and foil set. Now, I’ve never used foil in craft, at least not like this. To me it is something you put over the top of food in the oven so you don’t cremate the outside whilst cooking the middle, or the thing you use to wrap the kids lunch in when you’ve lost their sandwich boxes. Before starting I had a quick look at the magazine for inspiration. There were some lovely designs, and I had a look through my (rather too large) stash of Christmas card making materials for some suitable papers. The foils in the kit were pink, red and gold and I had some fairly contemporary coloured papers in my collection which I though coordinated well with the pink foil. For the first card, I cut a strip of foil the height of the greeting and embossed it, with the intention of using it as the focal point of the card. I cut it too big, which meant I had to do some trimming after I had embossed. Because I didn’t want to squash the embossing I used a steel ruler and craft knife to cut it to size. 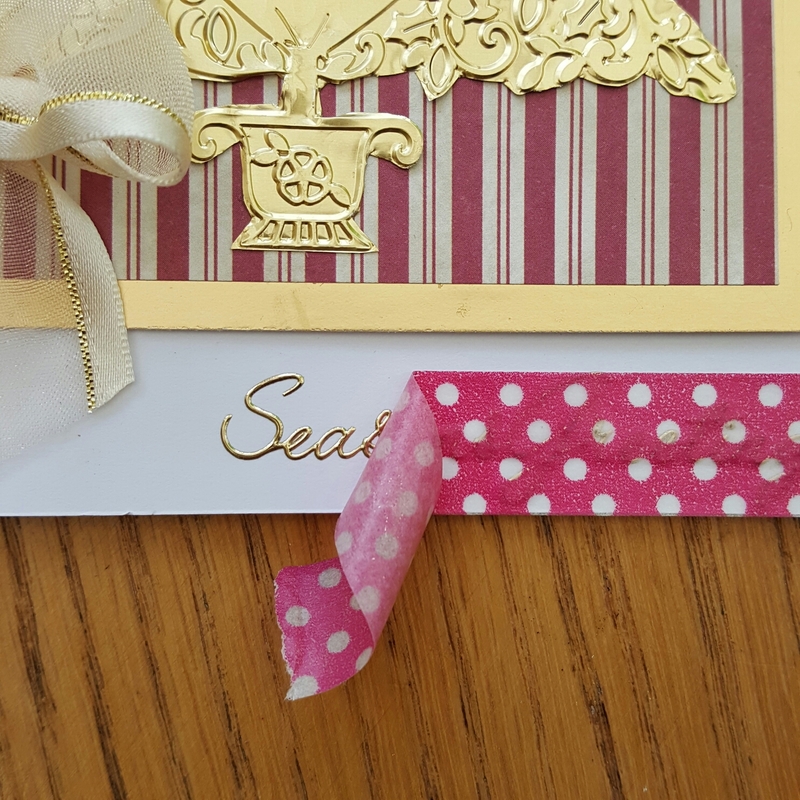 I cut a square of card and layered it with backing paper, adding a layer of ribbon. (Pro tip-stick the end of the ribbon inside the card and not to the back, otherwise you can’t open it. You’re welcome!) I added purple gems to embellish it, I’m still undecided on whether they were a good or bad idea but they do colour coordinate quite well (ish). After that I upped my game a bit and embossed the Christmas tree, which I then fussy cut and stuck to backing paper layered on mirror card. I added gems again, and a silver glittery greeting. I am beginning to take a shine (sorry, pun intended) to the pink foil. For my final card of the day, I decided to go a bit more traditional and use the gold foil. I embossed the Christmas tree again, and fussy cut it as well as I could. This was the biggest challenge for me as the foil was a bit tricky to cut neatly. I’m also quite bad at judging an even border around it when cutting by hand, but I’m pretty certain the recipient won’t be measuring. 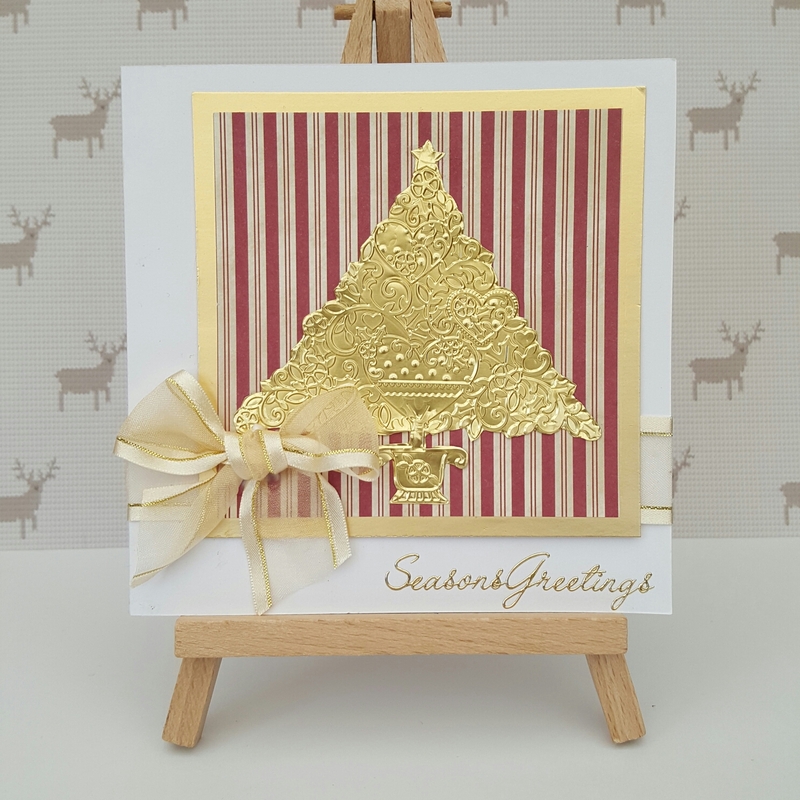 I chose a red stripy paper and a gold coloured backing card, along with a gold and cream ribbon to continue the traditional colour scheme. I’m not sure whether the bow should have been stuck on at an angle or not, as it covers the tree. However it also covers the glue splodge I made when sticking the tree on so it’ll have to stay there! The greeting was another peel off, and I used one of my favourite card making tips to put the (very thin and delicate) greeting on neatly. I used washi tape, but have used masking tape in the past too. First of all I firmly applied the tape.to the greeting whilst it was still attached to the backing sheet. I then lifted it, still attached to the tape, and carefully stuck it to my card before removing the washi tape. Ta da, neatly applied, non crinkled or stretched peel off greeting! Have you ever crafted with foil? Do you have any tips? Oh dear. I’m trying to be organised as I hope to get more work nearer Christmas, but I haven’t done any shopping yet! I think hand made is often more appreciated.. I knitted a waistcoat one year for my daughter when funds were tight .. She Loved it.. 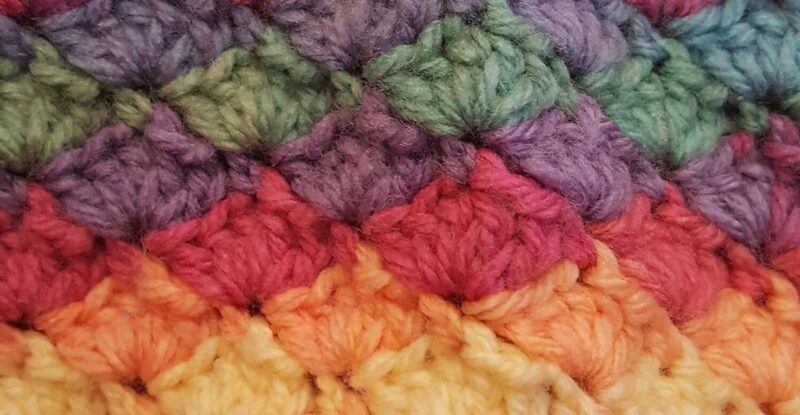 I ‘liked’ your comment about handmade presents because sometimes I think we need to remember that they are often the best kind. Anyway, these cards are really super. My favourite is also the gold one – just because I think it shows off the detail on the tree so well. Not cheap: priceless. Big difference! I absolutely love these…especially the pink ones! I wish I had time to make all of my holiday cards…it’s just not something I’ve ever gotten into. Kudos to you for branching out in all your craftiness! I love the washi tape tip too. It’s so clever! Fabulous cards! I LOVE the trees and absolutely adore the last card. It has an elegance about it which makes it look so incredible. Really great makes, Mrs. Craft. Thank you also for the brilliant tip on using Washi tape for lifting peel off words off the carrier sheet and onto a card. That’s definitely one I’m going to put into action! Great post. Loved it from start to finish. So pretty! Reindeer are so happy to look at, The trees are fun and classic! I love the foil ! If only I could get around to acting on all these inspiring posts you keep making. Love the tape idea, my daughter really struggles with peel offs. She is determined to make all our cards this year and I want rid of some stash so am trying to encourage her! I think it’s 14 weeks to Christmas (sorry!) so we had better start. Very nice 🙂 Those trees are lovely, and I am definitely going to use that trick for the greetings! Love your cards! Last one is my favorite! I’ve read somewhere, that you can adhere foil to a layer of thin cardstock or even paper before embossing it to prevent tearing… but I haven’t tried this yet. Ooooh! I havent ever crafted with foils. I must give it a go! These cards look lovely! Thank you! It is fun, I think the foil makes the embossing stand out more. Love your blog so far! Working on catching up to all your other posts but so far your crafts look awesome. 🙂 I will be posting so crafts on my blog as well here soon! I am gaining a lot of inspiration from you.